Demonstrate your commitment with this image. Project Azul Verde will customize the image, including calculating the figures and adding your business name and logo. You can print it for a table display or coaster, or use it on social media. Would you like to save $725/year while improving your brand? Let’s say your restaurant or hotel serves 300 drinks per day. By skipping the straw, you would eliminate about 60 pounds of plastic and save $725 per year, even while taking into account the 10% of customers who would request a straw. Demonstrate your commitment with this image. Communicate data to encourage behavior change and convey the environmental case. Project Azul Verde will customize the image, including calculating the figures and adding your business name and logo. You can print it for a table display or coaster, or use it on social media. Think about how you can form this into a story to build your brand. Take it further by talking about how you reinvest a percentage back into the community. Be sure to ask me for this signage to demonstrate your commitment and strengthen your brand. Use this Business Case Summary to launch your campaign. What would cause a business to shift from automatically including straws in customer’s drinks? My initial results indicate it’s COST SAVINGS, CUSTOMER DEMAND, AND EDUCATION ON THE NEGATIVE IMPACTS OF SINGLE-USE PLASTICS. I believe that the way we live, travel, recreate and do business impacts our communities and environment. As a sustainability consultant at Project Azul Verde, I look for ways that shape, and change, our behavior. While straws are a small fraction of a greater problem, this initiative provides both a way to start the conversation and an entry point to tackling larger sustainability issues. This research is part of my Volunteer Outreach Project as an Ocean Ambassador candidate with the Colorado Ocean Coalition (COCO). COCO’s mission is to lead a community of individuals to understand our connection to the ocean, unite through shared conservation values, and advocate and celebrate actions that promote a healthy ocean. It costs money to waste resources and haul away your trash so it makes good business sense to reduce the amount of trash you generate. Become part of the solution. The resources used to manufacture, transport, and dispose of a product that is used for a very short amount of time doesn’t make sense. Increasing zero waste ordinances are encouraging changes. It’s the opportunity to eliminate the use of straws. However many businesses will likely change to bioplastic compostable straws which have many of the same drawbacks as regular plastic straws. Straws end up on the beach and in the oceans, causing a host of issues from unsightly shorelines to microplastics, damaging tourism and healthy ocean ecosystems. The Business Case needed to be further developed. Here are the questions to frame our discussion. Give me 15 minutes or less to get your take. What is your default practice for serving straws in beverages? Why is this? What is your customer’s reaction to it? What would cause a change in your straw serving practice? What kind of straw do you and your customers prefer? Spread the Word: If you know others who would like to take this survey, please send me their email address or phone number. It would be a treat to be served a drink with a straw that is made out of a plant. Fennel, rye, and chive/onion come to mind, but chefs can work some real magic here. 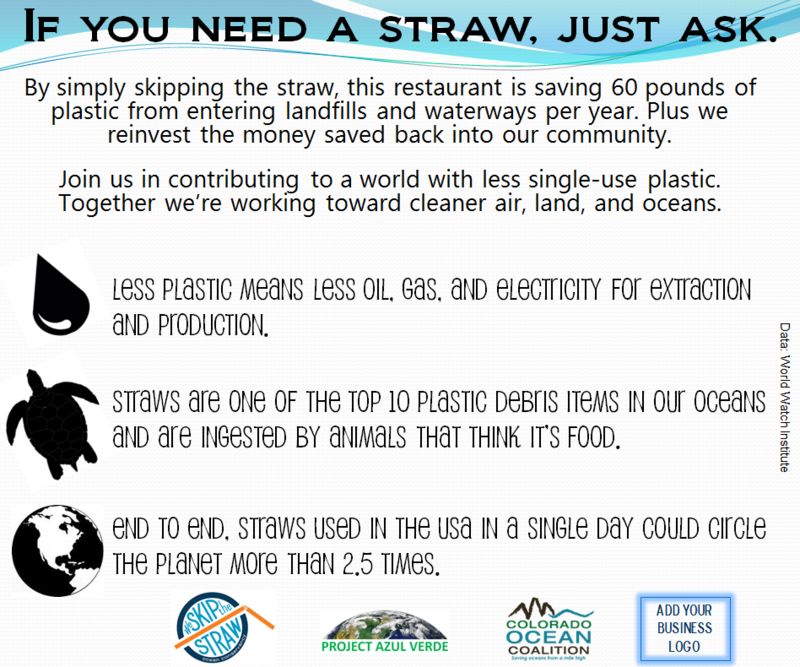 Take the Last Straw Challenge: when eating out, ask your waiter or waitress to skip the straw. 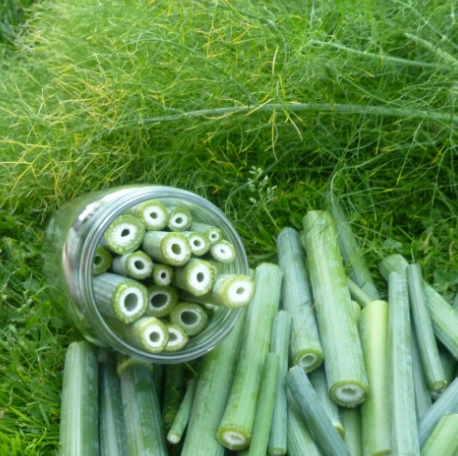 Fennel – a fun alternative!